-Human hair, fingernails and horse hooves are made from the same protein. 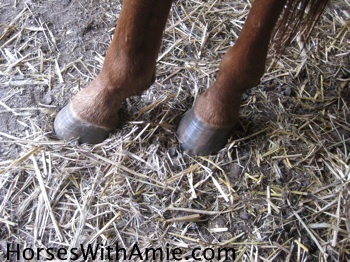 -Horses hooves grow approximately 1/4 inch per month, taking almost a year to grow from the cornet band to the ground. 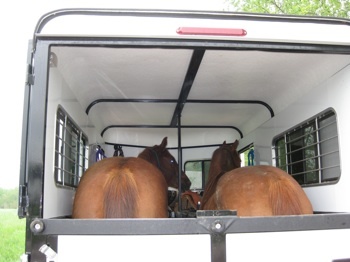 -A horse trailer or 'horse box' was invented in England in 1836 by Lord George Bentinck. Pulled by six horses it was invented to get his race horses from one track to the next. -When measuring a horse you use the top of the withers because the distance from the withers to the ground remains the same. (As long as the horse is standing on level ground.) If the horse was measured from the top of the head, the height could change every time. -Alfalfa is thought to be the first cultivated food fed to horses by humans, probably the Parthians, around 100 b.c. -The first grain thought to be domesticated, and probably the first to be given to horses was Barley. -In 1872, Leland Stanford (1824-1893) made a bet that at some point in the gallop all four of the horses legs are off the ground at the same time. Eadweard Muybridge (1830-1904) proved him right by using a series of 24 cameras and photographing a racehorse named Sallie Gardner. -William Cavendish (1592-1676) described the trot and the amble. The first person to record the difference between the canter (3 beats) and the gallop (4 beats) was Claude Bourgelat 1712-1777) but he got the sequence wrong. Etienne-Jules marey in 1872 was the first to publish an article on the correct sequence of the canter. The gallop wasn't firmly known until the Eadweard Muybridge's photographs of 1872. -Will Rogers (1879-1935) a political humorist had a horse named Soapsuds. - The horse is the state animal of New Jersey. -Cars with Horse names are the Ford's Mustang, Pinto, Bronco and the Dodge's Colt.